Come to Café Insecta, where you can get your own taste of entomophagy — the practice of eating bugs! Try bug-filled dishes prepared by local chefs while learning about the health and environmental benefits of this crunchy (and surprisingly delicious) practice. Cafe Insecta has been the center of BugFest since the event started more than 20 years ago, and each year it just keeps getting better. Cafe Insecta opens at 10am, and closes when the food runs out — so come early and vote on your favorite dish! Remember, Friends of the Museum get to use the Fast Lane, so join today! Eating bugs might sound weird, but not eating bugs is even weirder! Whether it’s Mexican agave worms or South African locust porridge, bug-filled dishes have found their way into the culinary palates of up to 80% of countries on earth! Did you know it takes 3,000 gallons of water to produce one pound of beef? 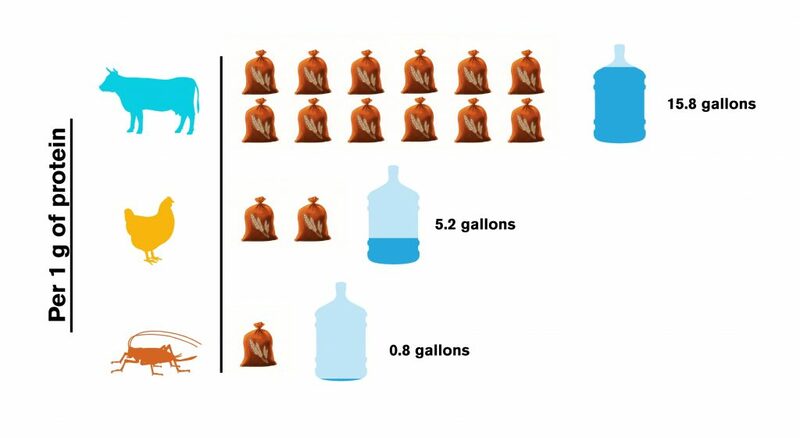 Compare that to only a tenth of a gallon of water needed to produce a pound of crickets! Insects also require less food, energy, and space than conventional sources of protein like pigs and poultry. Taken together, this means insects are a highly sustainable food source. When you eat a burger, you’re mostly eating cow muscle. But when people eat insects, they tend to eat the whole animal, which gives them more diverse nutrients. For example, whole insects are high in fiber, whereas steak and eggs have practically no fiber. Insects are also high in protein and omega-3 fatty acids. Every year Café Insecta plays host to adventurous chefs from all over the Triangle, who try their hand at crafting a dish using insects. 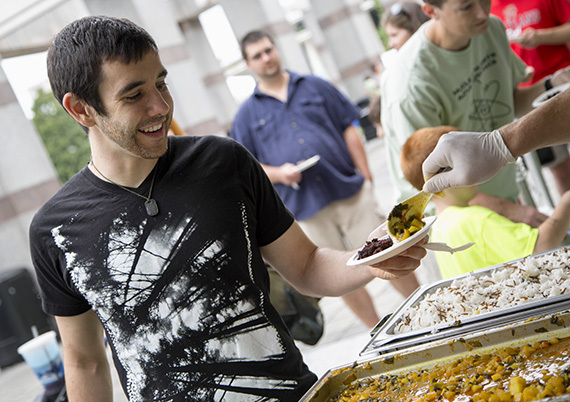 Chefs hand out samples of their dish to up to 3,000 event guests, who then vote on their favorite concoction. This year the winning chef takes home a trophy featuring an amazing hand-made model of our theme bug: the beetle!